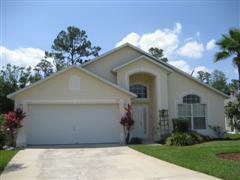 DISNEY - "SPECIAL" LIMITED TIME OFFER Beautiful 4 bedroom pool home with 2 en-suite masters. This is a beautiful 4 bedroom home boasts a king master with private en-suite bathroom with separate walk in shower and tub, as well as a queen master with private en-suite bathroom. 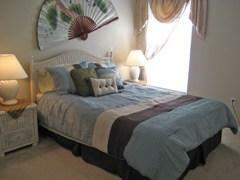 There are also 2 Twin bed rooms with a shared bath. TV's in the 2 Master bed rooms. There are to living areas and 2 dining areas, formal and casual. A spacious fully equipped open kitchen completes this home. There are washer and dryer for your convenience. As well as having its own amazing private pool, this home benefits from the exclusivity of being part of the Lake Berkley community. This means that guest are able to take advantage of other features such as the community pool, volleyball, internet cafe and tennis courts to name a few.